The Azuero these days. Photo by the Ministry of Agricultural Development. Panama has people in academia and in the Ministry of Environment who chart, study and predict the weather and climate, but the most systematic monitoring and projections come from two semi-autonomous public entities with vital interests in rainfall, the Panama Canal Authority and the ETESA power line company. Both of these predict the present El Niño condition continuing into next year, with ETESA projecting that the drought will not let up until the middle of 2016. That’s another year of drought. In light of that the 60-day state of emergency contains a reasonable set of steps, but why are we not imposing electricity saving measures, as we know that the reservoirs behind the hydroelectric dams are bound to be affected? And the new wells and mini-reservoirs in the Azuero — for how long would they solve many problems there? 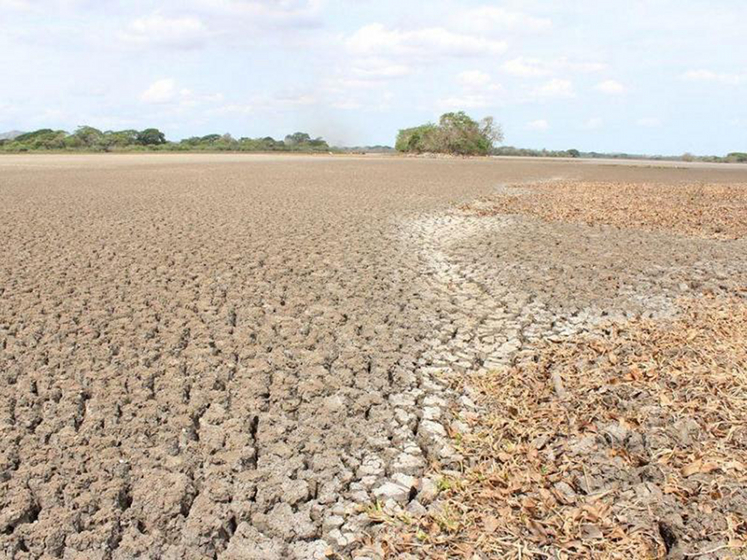 The climate is changing, but this drought will end. Sooner or later we will get another one. Meanwhile sea levels will rise — we don’t know how far or how fast, but this has been happening for a number of years now. We need to adapt, and to be ready to adapt even more. This painful but temporary emergency is a good occasion for the nation to discuss what’s happening and likely to happen, and to make some decisions. We start without a genuine public energy policy. What we have is a corporate energy policy ratified by the government — and let’s not call it a “free market” policy because it has major anti-competitive features like high taxes for imported solar panels and windmills, and a ban on marketing household-generated electricity on the grid. One of the salient features of the Barro Blanco dispute is the insistence of a thuggish Honduran family enterprise on the private appropriation of the Tabasara River without compensation to those who would be driven away by the loss of the water resources upon which they have depended for ages. Whether the question is interconnections with other countries’ power grids or the modernization of our own, private interests always seem to trump public ones, and the private interests of the wealthiest companies always seem to get priority over the private interests of smaller enterprises. Panama also doesn’t have a water policy to speak of. Ricardo Martinelli and his band of thieves wanted a water privatization scheme and it drew so much opposition that it was withdrawn. But in times of climate change the rejection of a policy we didn’t want does not equal a policy that we do need. Especially so, now that Juan Carlos Varela was elected largely on a promise to provide running water and indoor plumbing for every household. To do that requires expansion and interconnection of aqueduct systems, new water sources and new water conservation policies all designed to be flexible if conditions change. Zoning, drainage and public infrastructures for low-lying areas — above all for Panama City — need to be rethought now as sea levels slowly rise. Responding to the demands of the richest people to save their waterfront investments would be no proper way to set policy. Neither would a search to house people of more modest means who were living in safe areas that turned into flood plains. Failure to think ahead, followed by a scramble to replace wells into which saltwater has seeped, should not be an option. Yes, it’s boring and many of those who would volunteer for the job would also have ulterior economic motives that conflict with Panama’s national interests. But Panama needs to think past this drought to the next one and the one after that. Who leads in latest polling for the New Hampshire primary? On the Democratic side it’s Bernie Sanders, with Republicans it’s Donald Trump. It’s early yet. Trump carries an awful lot of baggage and it seems that every other time he opens his mouth he creates more. Does a large GOP constituency just love his sexist insults of Fox News’s Megyn Kelly? Maybe that’s a primary bonus among Republicans, but surely it’s a problem with the female majority of general election voters. He is similarly alienating African-American voters — few of whom will vote Republican — and the various Hispanic groups, of which anyone who wants to be president of the United States needs the votes of at least a substantial minority. If he survives the piranha attacks of his primary rivals and gets the nomination, look for a weakened Republican ticket losing more than just the White House. If he loses the nomination and runs as an independent, look for a terrible rout for both Trump and the GOP. But WAIT! Bernie Sanders is a socialist! Won’t the 1956 Cold War majority re-emerge and send him to political oblivion? That zombie forecast is not particularly the math of Republicans who think that Joe McCarthy was really cool, but of Hillary Clinton and the corporate Democrats. They have a ton of money to make the case and it looks like the neo-conservatives may switch back to the Democratic side this time to support Hillary. As the neo-cons recently argued in the National Review, Bernie Sanders — whose extended family was largely massacred in the Holocaust — is a “national-socialist,” that is, a Nazi, because he is for certain aspects of economic nationalism like investing in the USA and controlling immigration so as not to allow an influx of cheap labor and at the same time a democratic socialist who believes in quality public education, free university tuition, socialized medicine and economic safety nets like those that prevail across Northern Europe. Plus, say some neo-cons, Sanders is a self-hating Jew because he’s unimpressed with Mr. Netanyahu and opposed to a war with Iran. The American electorate is weary with old dynasties, “free trade” dogma that extols economic globalization on terms dictated by corporations, ruinously expensive US wars all over the world and contrived racial, ethnic and religious strife. The moderates chasing after the extremes may have found the winning primary formula. Those coming from what used to be called the fringes who say modest things but uphold certain bedrock principles are the ones whom you find in the biggest campaign season crowds. Let us never negotiate out of fear but let us never fear to negotiate.